AutoCAD detailed drawings of all Construction Categories according to the IAAF requirements would be issued by our engineers. 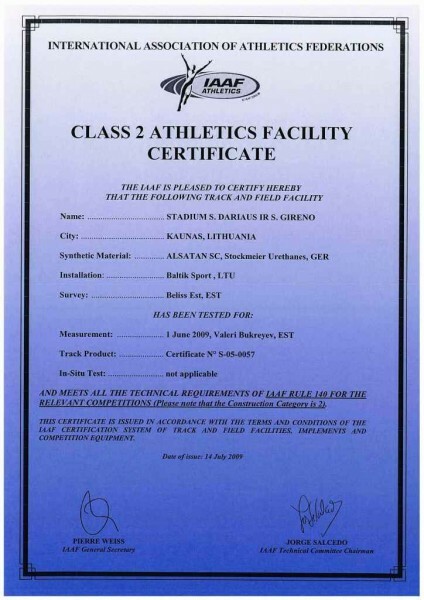 All we need to know from customer is a level of athletic competition that would be hosted on your track. The DWG layout drawings of IAAF Standard 400 m Outdoor and 200 m Indoor tracks available per request. Regardless is it reconstruction of existing facility or new track, the topographic survey creates a base of future layout and calculations of civil works value. As far as IAAF requirements allow the tolerance of the running distance length only +0,0001 x L, the proper stakeout of reference points become most important. Having valuable experience and using most sophisticated measuring equipment as Robotic Total Station, we ensure future Running Track conformity to IAAF Requirements. As the final result of track surface installation is critically depending of sub base quality, we offer to our customer hi-tech supervision on all previous civil works stages. The result of provided technical support to other subcontractors is shortening of civil works lasting and higher quality. Our crews have a great experience in installation of all type surface concepts; “semi prefabricated”, “in-situ” and “roll-out products”. All known running track surface systems such as; Full PU, Sandwich and Spray coat, were been installed by our guys in different circumstances and climate conditions. We feel and understand material’s behavior of different manufacturers. As far as we aren’t related to any trade mark we can offer you installation of any brand. 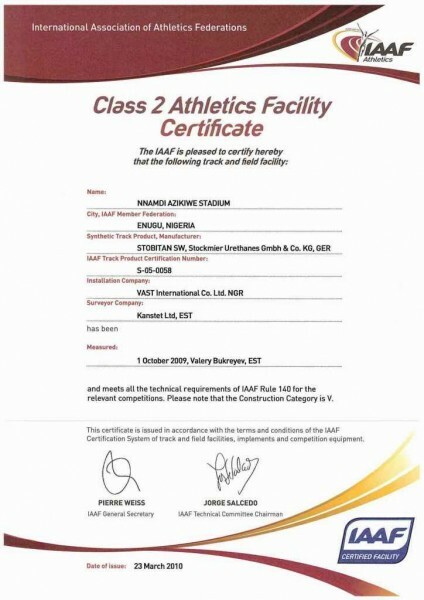 As per IAAF requirements the Track length should not exceed 400,040 m and couldn’t be shorter than 400 m along the theoretical running line, the actual track line marking becomes a very delicate and complicate task. It might be done by highly skilled and experienced staff only. 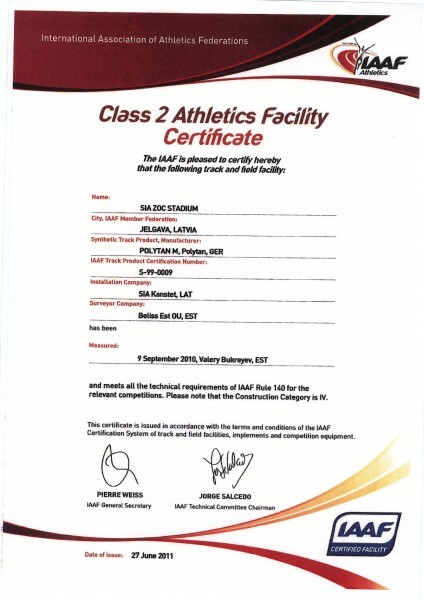 Our line markers already were completed a number of projects that successfully passed through IAAF Certification System. Our line marking crews equiped by Trimble measuring instruments for survey. We use LS12, LS15 (made by SMG Gmbh.) as well as our own designed light weight portable lining machines for easy airplane travel. Our people are ready to flight any time anywhere, where high quality Line Marking is needed. 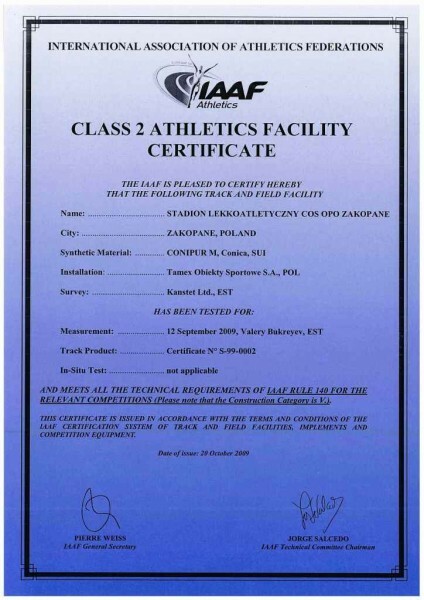 List of IAAF certified Tracks, surveyed by Kanstet Ltd. 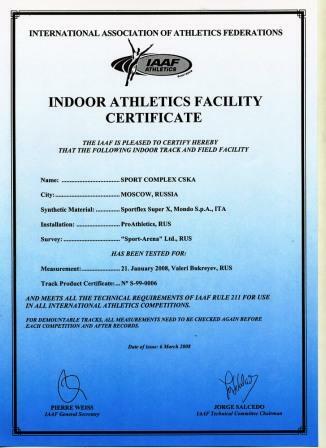 List of IAAF Certified facilities available on IAAF website. Click here. Our current line markings Reference List is: 71 Running Track for more than 17 customers in 13 countries around the Globe.